Like Mario, talented new striker Leon (Aaron Altaras) from Hanover, Germany is just one step away from stardom. Initially in competition with one another, the new teammates soon realize that working together will make each of them better and help them both achieve their goal. To help them develop a better on-field chemistry, the team orchestrates a shared apartment for their two star players. But for Mario, living with his superattractive new rival opens the door to a whole new set of off-field complications. Though unspoken, the mutual attraction is obvious. Once Leon finally makes the first move, a passionate sexual relationship begins. Mario resists falling in love, but despite his efforts to remain focused, the relationship intensifies. Madly in love, the two must now navigate the hyper-masculinity of the locker room, the politics of professional sports, and the weighty expectations resting on their shoulders. Hubacher, who took home Switzerland’s top acting honor for this role, and Altaras bring writer-director Marcel Gisler’s brilliant screenplay to life with tremendous depth and understated emotion. 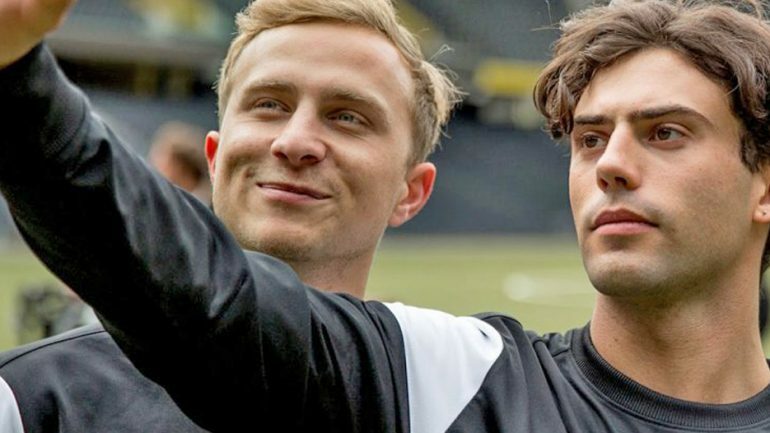 Mario is filmed on location in Stade de Suisse with spectacular sports scenes, providing a remarkable backdrop for its powerful story. Gisler’s picture-perfect storytelling resists melodrama and formulaic turns, consistently finding new ways to grip its audience. Once Mario has you in its grasp, it won’t let go until long after you’ve finished watching it.